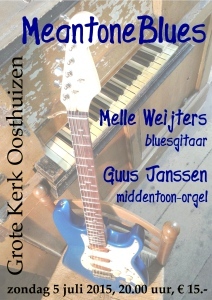 In the program MicroBlues (September 28, 2014, Muziekgebouw aan ‘t IJ), guitarist Melle Weijters and keyboardist Guus Janssen explored new possibilities for the blues in the 31-tone tuning. For this concert, two extraordinary instruments were used: an 31-tone electric guitar and the Fokker-organ. The meantone, which sits comfortably in the division of the octave in 31 equal parts, played an important role.